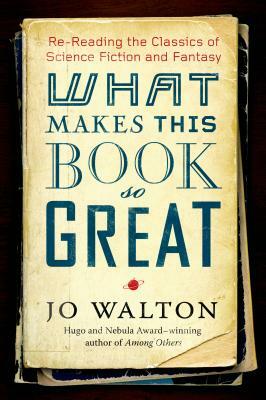 As any reader of Jo Walton's Among Others might guess, Walton is both an inveterate reader of SF and fantasy, and a chronic re-reader of books. In 2008, then-new science-fiction mega-site Tor.com asked Walton to blog regularly about her re-reading—about all kinds of older fantasy and SF, ranging from acknowledged classics, to guilty pleasures, to forgotten oddities and gems. These posts have consistently been among the most popular features of Tor.com. Now this volumes presents a selection of the best of them, ranging from short essays to long reassessments of some of the field's most ambitious series. Among Walton's many subjects here are the Zones of Thought novels of Vernor Vinge; the question of what genre readers mean by "mainstream"; the underappreciated SF adventures of C. J. Cherryh; the field's many approaches to time travel; the masterful science fiction of Samuel R. Delany; Salman Rushdie's Midnight's Children; the early Hainish novels of Ursula K. Le Guin; and a Robert A. Heinlein novel you have most certainly never read.